For your convenience, we've provided download links to as many of these applications as possible. The majority of them, however, come preinstalled in the most popular Linux distributions, or are available through online software installers such as Fedora's YUM or Ubuntu's Synaptic Package Manager. Installing new software through your Linux distribution's package management system is generally better than installing programs manually, so check your OS's software repositories before downloading any of the apps from our links. The open-source Office replacement OpenOffice.org does nearly everything Microsoft's suite does, for free. If you like Microsoft Office, try OpenOffice.org. Microsoft's flagship product is feature-rich and friendly, but it's expensive and it doesn't run natively under Linux. 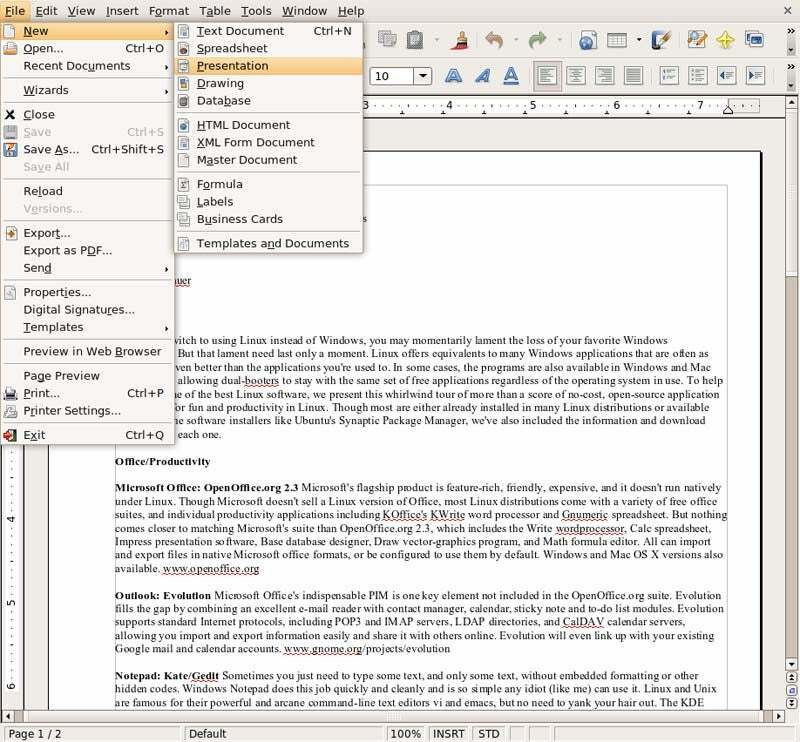 Though Microsoft doesn't sell a Linux version of Office, most Linux distributions come with a variety of free office suites, as well as individual productivity applications such as KOffice's KWrite word processor and Gnumeric spreadsheet. Nothing comes closer to matching Microsoft's suite than OpenOffice.org 2.3, which includes the Write word processor, Calc spreadsheet, Impress presentation software, Base database designer, Draw vector-graphics program, and Math formula editor. All of the apps can import and export files in native Microsoft Office formats, or be configured to use them by default. Windows and Mac OS X versions are also available. Evolve away from Windows with Evolution, a free Outlook work-alike included with the Gnome desktop. In place of Outlook, use Evolution. Microsoft Office's indispensable personal information manager is one key element for which the OpenOffice.org suite has no counterpart. 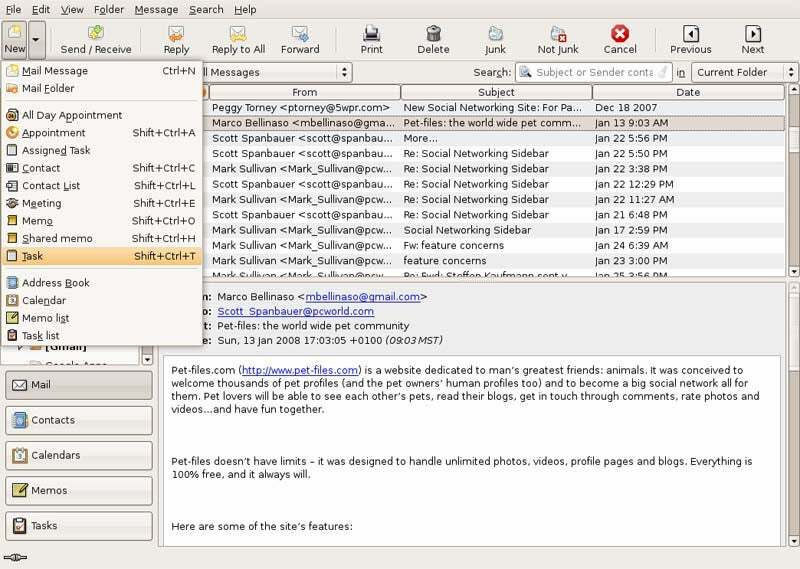 Evolution fills the gap, combining an excellent e-mail reader with contact manager, calendar, sticky-note, and to-do-list modules. Evolution supports standard Internet protocols such as POP3 and IMAP servers, LDAP directories, and CalDAV calendar servers, allowing you to import and export information easily and share it with other people online. Evolution will even link up with your existing Google mail and calendar accounts. Instead of Windows Notepad, run Kate or Gedit. Sometimes you need to type some text, and only some text, without embedded formatting or other hidden codes. Windows Notepad does the job quickly and cleanly, and is so simple that any idiot (like me) can use it. Linux and Unix are famous (some say infamous) for their powerful and arcane command-line text editors, vi and emacs. No need to yank your hair out when you need to edit a text file, however: The KDE desktop manager (the default in SuSE Linux) comes with the lovely Kate, and the Gnome environment (the default in Ubuntu) offers Gedit. Each is as easy to use as Windows Notepad is. If you like Quicken, try GnuCash. Though Intuit's products are still the tops in computerized personal finance management, they don't run natively under Linux. GnuCash may not be quite as slick, but like Quicken it tracks all of your accounts and expenses and handles double-entry accounting; it can import Quicken QIF and OFX files, as well. If you are a light user of QuickBooks (I'm still using the 1999 version), you may be able to use GnuCash for your business too. Otherwise, try the more industrial-strength SQL-Ledger application. The best way to get GnuCash is through your package manager, but you can read more info at the GnuCash site. 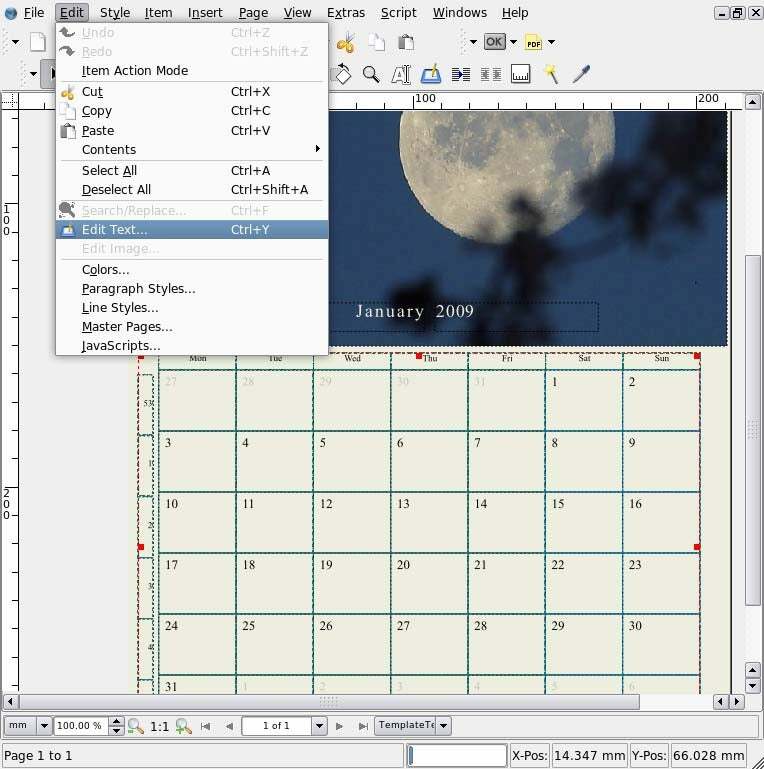 Publish brochures, newsletters, presentations, calendars, and more using the lightweight desktop publishing app Scribus. Trade in Microsoft Publisher for Scribus. Microsoft's quick-and-easy desktop publisher meets its open-source match in Scribus, which makes designing newsletters, brochures, and presentation slides from scratch, or from included templates, easy. In addition to offering the usual grid, hyphenation, and typography tools, Scribus can export your document as a PDF file, making it a good stand-in for Adobe Acrobat, too. Scribus can't import your existing Quark or InDesign projects, however.